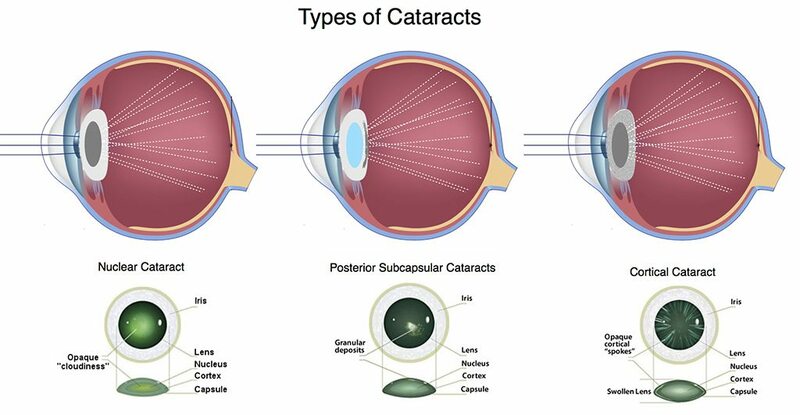 Development of cataracts is usually part of the normal human aging process. The natural, clear lens of the eye gradually becomes cloudy, blocking light as it passes through the eye. The condition can be compared to a window that is frosted or “fogged” with steam. 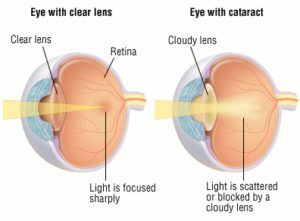 Blurred vision, glare sensitivity, difficulty in reading in low light and declining night vision are typical symptoms as cataracts develop. Glasses and medication are ineffective in improving visual loss caused by cataracts. When cataracts cause vision loss that interferes with your work, lifestyle, or activities of daily living, it may be time to have them treated surgically. Each year millions of people undergo cataract surgery. It is one of the most common and successful procedures performed in the world. Our skilled ophthalmologists have performed thousands of cataract surgeries and look forward to helping you decide if cataract surgery is right for you. With continually improving surgical methods, cataract surgery is quicker and easier than ever before with little to no down time. Contact us today to schedule your cataract evaluation with one of our providers, and let us help you bring back clarity and brilliance to your vision!